There’s no beep, beep and they certainly can’t outrun a coyote, but the bird made famous by Warner Brothers does share a few traits of its cartoon character. They often are seen running across roadways, and they’re quite fleet afoot, although you won’t catch them racing a car. Above: Greater roadrunners is a stealthy and efficient predator, feasting on reptiles during warmer months but also taking snakes, including rattlers, and small mammals. Most of the water a roadrunner requires is obtained from their prey. NMDGF photo by Dan Williams. A member of the cuckoo family, this bird can reach running speeds of about 20 mph. The coyote wins the race at about 35 mph and, while not a staple of their diet, coyotes certainly are capable of catching, killing and eating roadrunners. But while the coyote might win the race, the roadrunner is no slouch. 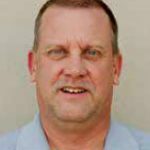 “These birds are cunning, opportunistic predators that feed almost exclusively on meat,” said Peggy Darr, avian ecologist with the New Mexico Department of Game and Fish. This is an important component for their survival in an arid climate, obtaining most of the water they need from the prey they consume. About the only time roadrunners will consume vegetation or berries is during the winter when some prey species are scarce. While roadrunners will take birds, small mammals, insects, scorpions and spiders, a large component of their diet is made up of reptiles such as lizards and small snakes. Occasionally, they’ll take larger snakes, including rattlesnakes. Roadrunners consume snakes whole. If the snake is too large to swallow at once, the roadrunner will continue to stroll around with part of the reptile dangling from its beak. As the first part is digested, the rest is slowly consumed. As is the case with many wildlife species, when food is scarce, hatchling runts may be fed to the strongest chicks to improve the odds of survival. Roadrunners are easily identified because no other bird really looks like them. 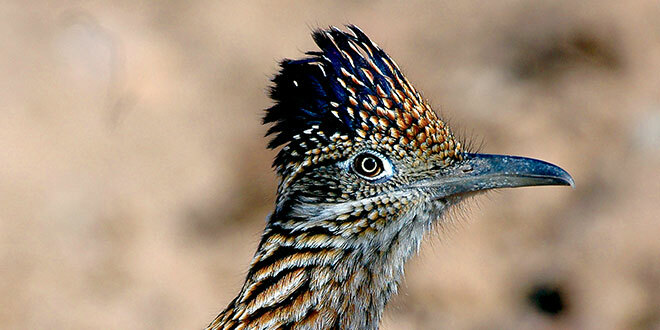 Greater roadrunner is a distinctive bird, given their long-legged, long-tailed shape, crested head, and heavy bill. NMDGF photo by Dan Williams. The state bird of New Mexico, a large roadrunner weighs in at about 1 ½ pounds, and is not an overly capable flyer. Short bursts of flight are possible, but they quickly return to the ground and run, leaving a distinctive track that resembles an X. This X has played a role in Native American culture. The X is a symbol to ward off evil, the shape disguising travel direction and preventing evil spirits from following. 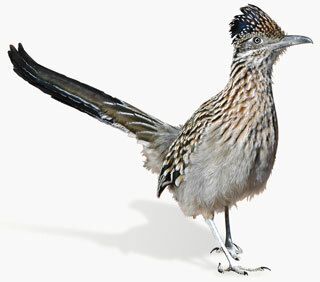 Below: Greater roadrunner is a distinctive bird, given their long-legged, long-tailed shape, crested head, and heavy bill. NMDGF photo by Dan Williams.